The 32" 5-in-1 Collapsible Reflector Disc from Raya is a versatile light modification tool than can find uses in the studio and on location. This disc provides white, silver, gold, and black surfaces as well as a one stop translucent diffusion panel. The 32" size is designed for mid-range or 2-person portrait shoots as well as small still life setups. The tool allows you to quickly and easily make adjustments to your lighting in order to get the look you want. Also, the disc is able to fold down to 1/3 its size and be stored inside the included carrying bag. Box Dimensions (LxWxH) 11.7 x 11.55 x 2.5"
5-in-1 Collapsible Reflector Disc (32") is rated 4.8 out of 5 by 77. Rated 4 out of 5 by Robert from Seems well built but... So, the way these work is you get a disk with diffusion on it and then a sleeve you can zip over the disk. The sleeve on mine gives me a choice of white/silver or if you take it off, turn it inside-out, and put it back on you can get gold/black. You can leave the sleeve in place when you fold and stow it. I may take it in for alterations so that I can get White/Black and Silver/Gold. I notice a user in 2016 got it this way and complained so Raya seems to have changed it. Now I'm miffed so I guess they can't win until they devise a way to make the sides of the sleeve reversible separately. But other than that, it's a perfectly serviceable disc. Rated 5 out of 5 by KDCinTX from Works Great. Good Quality. 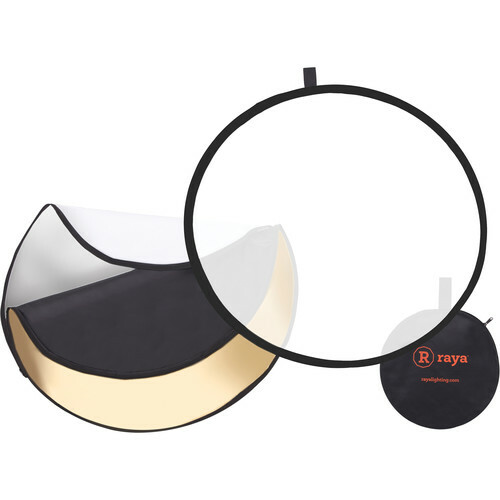 This reflector is easy to use either hand held or with a reflector holder. It folds flat so it doesn't take up much storage space. I didn't have any trouble changing the covers. It helps to squish the reflector just a little while zipping on the different covers. I use this reflector for portraits and have been very satisfied with the size, quality of the relective colors, and durability. Rated 5 out of 5 by Edmund from Great Tool, Great Bargain. Purchased this for location portraits. The silver and gold surfaces are way to harsh for any use at all (for me) as they reflect too much light and blind my clients. I probably need to move it further away when using these surfaces. The white reflects nice soft light without any apparent color cast but you need to be up close. The translucent works great as a scrim and the black is perfect for flagging. Probably opt for a larger one for groups bigger than 4(max) people as the coverage is not wide enough. Rated 5 out of 5 by Chris from Works well A great 5-in-1 reflector that is built well. I decided to purchase this reflector after a Neewer one I had broke at the zipper. This reflector so far feels durable with quality zippers and materials. For certain applications, a bigger one would be nice, but for portraits of one or two people, this works great. Rated 4 out of 5 by new to panasonic bridge camera from Decent price I am not a professional or even a moderate photographer. I purchased out of curiosity. I don't even know when or if I will ever use. But, it appears to be of decent quality. I purchased without realizing this is for outdoors use. But, i believe i can use indoors if i have a light source? Rated 5 out of 5 by Natalia from Nice collapsible Reflector! Great size for outdoor shooting, portable enough to carry between composing the shots, big enough to lit up the scene (of course you have to be close-ish to the subject(s)). Overall, good value for the price! Rated 5 out of 5 by MoBo from It Works I wanted a reflector not too big and not too small and this one is just the right size and you can assemble it very quickly. Perfect for laying it down on the posing table. Rated 5 out of 5 by Melinda from Highly recommended I use this reflector with a Nikon D750 and various lenses. It's the best tool I own and was one of the least expensive. Highly recommended! How to refold this disc to put away? It's tricky at first. You don't want to fold it, you want to twist it. Hold the disc on opposite sides and then rotate each side - clockwise on one side, counterclockwise on the other. Think of making a figure 8 and keep rotating it. If you're doing it right, it should fold up with very little effort. Is the silver surface actually silver (with a lot of specular reflections) or gray (only diffused reflection)?